I spotted this note, taped to the wall above the laundry soap shelf a couple of days ago. It's not my note, but my daughter's. While this may seem insignificant, it's important in several ways. Olivia, 14, wasn't asked to do laundry, nor was it listed on a chart. There was no gold star, item or cash reward she could earn by doing laundry. More importantly, our love and support of her was not contingent upon her completion of this particular household task. In light of recent appalling parenting practices that made headlines last week (and one which I will not link to), I think this is a very important distinction to make. So why would a fourteen year old take on the week's laundry, without being cajoled, coerced or bribed into doing so? The answer is simple: she wanted to, in her words, "better know the science of laundry". 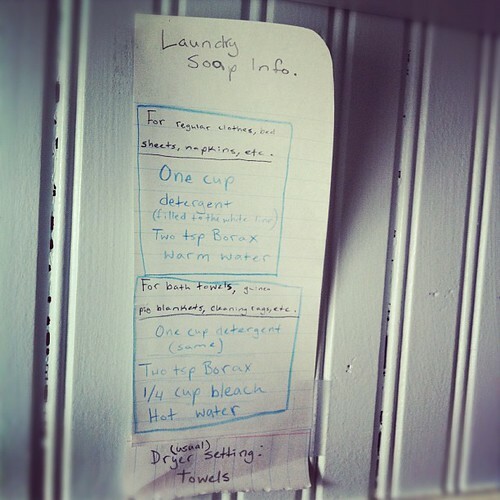 (Both the kids know the basics of doing laundry, but not as regular, artful practice.) In other words, she wanted to learn a new task, and she wanted to contribute to her home. Yes, her home. This home is not a space that Alex and I are letting our children occupy on borrowed time. This home belongs to all of us. Olivia wanted to learn something for the simple joy of acquiring skill and knowledge and competency. After many loads, making notes to herself and practicing meaningful work, she contributed to the care and keeping of our home. And it all happened without any negative behavior from parent or child. This is consensual living, and unschooling in practice. Olivia, self-motivated and self-directed, took on a task that was both unassigned and non-compulsory. By doing so, she gained skill and competency and confidence in a necessary household task. As well, she benefited and contributed to the function, well-being and health of her home. How good it is to know that our children feel like equal members of our household, that they can contribute and benefit us all, without feeling forced to do it. Amy, thank you for this beautiful picture of how it can look. A gift into my day. Thank you, Cate! I really appreciate that! I just love this!!! Many kudos to Olivia for taking the intiative and to her parents for raising such an industrious young lady! Thank you, Sheri. I truly think all people, yes, including kids and teens are naturally drawn to caring for their homes, if they are given the freedom and know-how to do so, free of coercion. While I appreciate your post, I don't understand why it had to written with such a "look at how much better we are" tone. Good for your child taking initiative to help with the household duties that keep her home running smoothly and happily. This is not something that should be unique as all children should be taught the value of working together as a family to make the family life smoother and happier, contributing to the "team" that is a family. Thank you for reading and for your comment, AlixJ. My intent was not to have a better-than tone, nor to be prescriptive. What I was hoping to do (and it's true, I may not have done it well-enough, for certain), is show how, especially in contrast to such combative, abusive tactics as a certain gun-shooting dad did recently, that children and parents can live together without a constant battle about property or chores or expectations. I truly was sharing a snapshot of our week. Thanks so much, Kelly. I know this is a lifestyle that is very difficult to convey, but I know that you understand. Hi Amy, I have been reading your blog for the last few months and am so greatful to have discovered this sweet space! We are an unschooling family of two little girls living in MA and we it's always so great to have a glimpse into what the future could look like for us! Thank you for this lovely piece (I loved it so much I had to share it on Facebook!) it's just what the world needed in the wake of the aformentioned Dad video this week! Have a wonderful weekend! Aren't you lovely, Shel, thanks so much. Yes, I confess to only peeking at your blog (your girls and home are adorable!) and I look forward to spending more time there. Since you are in MA, have you attended or considered attending the Northeast Unschooling Conference http://www.northeastunschoolingconference.com/(end of August in Wakefield)? There's lots of support and good things happening there. I love knowing that you are unschooling, too. Thanks again for sharing my post and for reading and commenting! Shel, please, please, don't ever worry about responding, really. I so understand birthday season and holidays and all that can happen, especially with kids in the house. And yes, we are planning to attend NEUC and of course we will meet up! This will be our third NEUC, so we're excited. I hope you can make it! I love your blog. Your writing is so thoughtful--graceful meditations that make me stop and think about (my) life. Thank you for sharing. Read a lot at the consensual living site you linked to, and then thought and observed a lot. Do you have suggestions/links about consensual living with younger children? Cannot say enough good things about this post. Our family style - and I never knew it had a name - has been that "we're a team, and we all work together on what needs to be done." I don't pay my daughter to help around the house (nor do we do traditional "allowance" of any kind), and I don't give her a list of "stuff" that she's supposed to do. That said, this 12-year-old girl is incredibly helpful and I think she feels much more like a contributing member of our family because SHE is choosing the areas in which she is able to make a difference. Yes, there are those things that "nobody" likes doing, but we pretty well rotate those, and Sarah, our daughter, sees my husband, my mom (who lives with us) and me willing to take our turns with the necessary things, so she finds herself willing to do so as well. I absolutely respect ANY other opinions on this; I just know what's worked for us; but it was nice to read your post and see our style so clearly summed up, especially as it relates to unschooling, which we're new to. Thanks! I wish I knew how to get to where you are. My children hate all cleaning- even cleaning up their own messes. They are more than happy to live in chaos if it means they don't have to clean.